With a comprehensive branch network, as well as a large fleet of lorries, spotted regularly travelling up and down the UK’s motorways. Elliott’s national presence places them in an enviable position as a leading provider of quality modular accommodation systems. Established in 1963, the Elliott Group Ltd began life as Elliott’s of Peterborough and was formed to manufacture and sell mobile classrooms in and around the local area. Throughout the years, the company expanded out of their home territory and were soon supplying their products and services on a national scale. Their acquisition in 2005 by the Algeco Scotsman Group, has brought about major influences to not only Elliott themselves, but the entire industry in which they work. A world leader in modular space and secure storage solutions, the Algeco Scotsman Group manages a fleet of more than 320,000 units with operations in 26 countries throughout Europe, the Middle East, China and North America. The company’s legacy is grounded in its reputation for exceptional customer service, effective management of business operations and consistent product innovation. To maintain this reputation the group regularly invests in the expansion and enhancement of its services and extensive product range. As part of this investment the company have made a major contribution to the quality and efficiencies of many of its Elliott sites in the UK. The site yards, where the preparation of a key range of portable accommodation takes place, are typically made up of tight areas, small spaces and extremely heavy and large products. It’s not a job for a typical forklift. “Our old equipment just wasn’t meeting expectations anymore. It had become shabby, unreliable and most importantly expensive to maintain.”Explained Elliott’s Nigel Quinn, who had recognised the need for a more substantial and tougher fleet to complement the improved sites. The operability of Elliott’s Ampthill site is critical for the thousands of organizations that rely on them for their modular space and storage needs. To that end, the company places providing an outstanding service and excellent product lead times as essential to their offering. 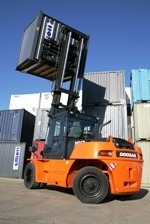 As part of this the company relies heavily on the forklift trucks that operate within their yards. 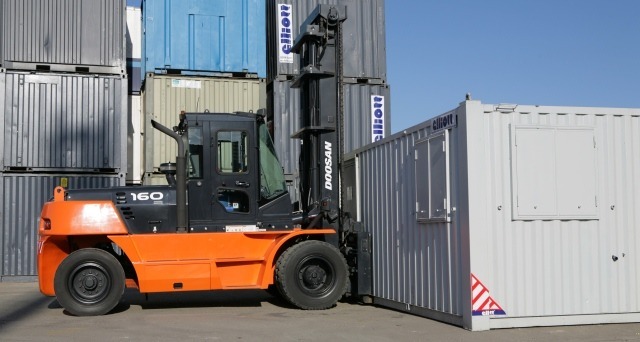 After taking a good look at Elliott’s site and its existing trucks, local Doosan dealer Genesis, recognised there were significant savings to be made by restructuring the fleet to more accurately reflect Elliott’s business needs. Genesis recommended seven new Doosan D160s for the existing application. 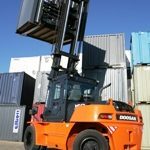 Designed to handle the toughest tasks in the most demanding applications, the D160 is one of the most robust and durable machines, making it the monster of Doosan’s forklift line up. Doosan’s UK general sales manager, Paul Watson believes the equipment is well suited the application and will provide superb value for money.